• Is there a purpose of buying an online phone card? • How to look for the best rates offered? 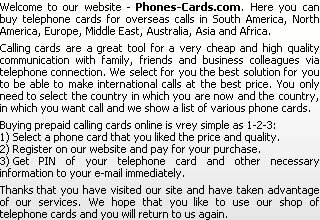 • How to select the right online phone card? • What are the charges levied in a calling card? • Is there an option to purchase more of a same refillable phone card? • Can I change my phone number that is registered with the site? • Is there a procedure to register different phone numbers to the refillable phone card? • Can I register with a same phone number or the same name for all the refillable phone cards I purchase? • Is there a process to refill the permanent PIN? • Is there an option to find the balance and the remaining minutes left in my calling card? • In the Jupiter calling card, is there an option retrieve the forgotten password? • Is it necessary to create or register an account? • What is the process of creating or registering my account? • What is the procedure to follow if I have not received any confirmation even after registering my information in your site? • Is there an option to create many accounts? • What do I do if I have forgotten my password? • What do I do changing my email (especially for existing customers)? • Is there a process to alter "My Profile" or the registration information? • How to make a placement online for an order? • What is the mode of payment? • How will I know that my online financial transaction is protected and safe? • What is meant by the CSC code? • What do I do if my I'm unable to make a payment online? • Is there a necessity to verify a purchase or an order? What is the meaning of Verification Process? • What is the period of time taken to complete a verification process? • What are the advantages as a verified customer? • What do I do if I get a letter regarding verification from you even though I'm already verified? • How to make a call? • Is there a possibility to find if the calling card has the Local Access Numbers? • What is the difference between making a call from the US landline or a cell phone? • What is the information to notice when I'm calling from a cell phone? • What happens if we call from a Payphone? • If I get trouble with my phone card, whom do I contact? • What are the reasons for the lesser amount of minutes displayed when compared with the website? • What do I do if I am charged though my call did'nt get connected? • What do I do if I do not receive a connection? • What can I do if I get a message stating the PIN number is invalid?